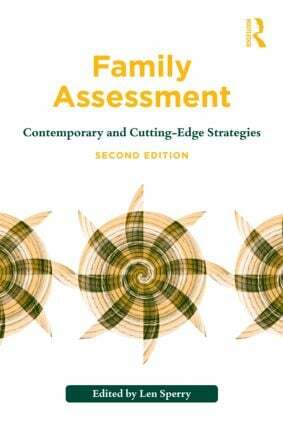 "Family Assessment: Contemporary and Cutting-Edge Strategies should be on the desk of every clinician and researcher engaged in the psychological and behavioral assessment and treatment of children, adolescents, families, and couples. In the age of evidence-based practice it is critical that state-of-the-art assessment tools are used, and Dr. Sperry and his colleagues offer a readable, practical, researched-based and fully updated guide that will sure to keep mental-health professionals on the cutting-edge of professional assessment. This book will make their job easier for sure." "Encyclopedic in scope, systematically organized, and reader friendly. This volume will definitely be the go-to text for students, practitioners, and researchers seeking assessment measures and a myriad strategies for evaluating children, couples, and families." "This important book will surely become, like the first edition, a core resource for students, practicing clinicians, and family researchers." Sperry, Family Assessment: An Overview. Duffy, Chenail, Qualitative Assessment. Nurse, Sperry, Standardized Assessment. Hampson, Beavers, Observational Assessment. Sperry, Ongoing Assessment. Bagarozzi, Sperry, Couples Assessment Strategy and Inventories. Cunningham, Scott, Child and Adolescent Assessment Strategy and Inventories. Yingling, Parent-Child and Family Assessment Strategy and Inventories. Fernandez, Veshinski, Child Custody and Divorce Assessment Strategy and Inventories. Olafson, Connelly, Child Abuse Assessment Strategy and Inventories. L'Abate, Family Assessment: Current and Future Prospects. Len Sperry, MD, PhD, is a professor of mental health counseling at Florida Atlantic University in Boca Raton, Florida, and clinical professor of psychiatry at the Medical College of Wisconsin in Milwaukee. He has some 600 publications, including 62 professional books. He is lead author of Couples Therapy, and is on the editorial boards of the American Journal of Family Therapy, The Family Journal, and the Journal of Marital and Family Therapy.